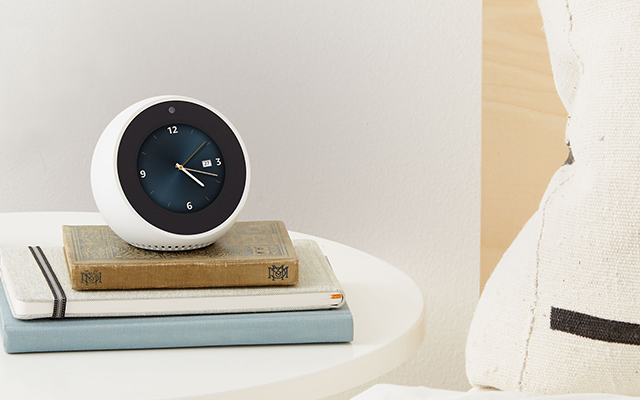 Echo Spot features 2nd generation far-field technology with four microphones, beamforming technology, and enhanced noise cancellation, so it can hear you from across the room—even while music is playing. If you have more than one Echo, Alexa responds intelligently from the Echo you're closest to with ESP (Echo Spatial Perception). Echo Spot is small and compact, and fits easily into any room of your home. The compact size and viewing angle of the screen make Echo Spot ideal for use on a nightstand or desk as a smart alarm clock that can also turn your lights on and off, show your commute time, get the weather, or show your calendar. Or use Spot in the kitchen to easily set and see timers, call friends and family, see shopping and to do lists, and more. 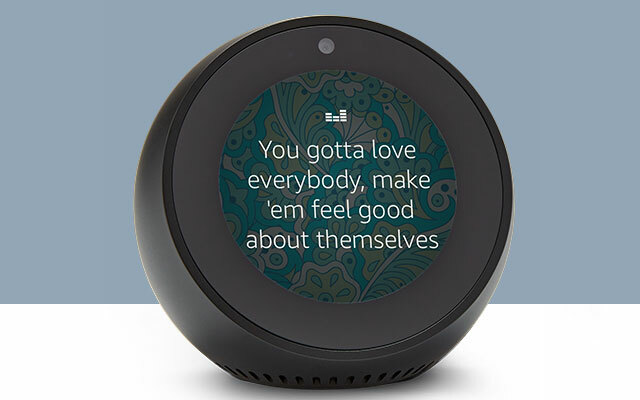 Echo Spot can connect directly to speakers using a 3.5 mm stereo cable or Bluetooth to add voice control to your home stereo system in the living room or den. Plus, with multi-room music, play your favorites throughout your home across multiple Echo devices (Spotify and Sirius XM coming soon, Bluetooth not supported for multi-room music). For news and information you can see and hear, just ask Alexa for your video flash briefing from CNN, Bloomberg, and more. Curious about the latest movie trailers or showtimes? Just ask. Echo Spot helps keep you organized at home. Start a timer in the kitchen and watch as it counts down, or easily see and manage your family's calendar. Sign in to the Alexa App to take your to-do and shopping lists with you. Just add an item to the list from home, and whoever is out shopping will see it added instantly on their Alexa App. Echo Spot provides hands-free voice control for your music. Watch as the display comes alive to show song lyrics, custom stations, curated playlists, and album art with Amazon Music. Listen to tens of millions of songs with Amazon Music Unlimited. Echo Spot also connects to Spotify, Pandora, iHeartRadio, and TuneIn—giving you voice control for all of your music. Echo Spot is Bluetooth-enabled so you can stream other popular music services like Apple Music from your phone or tablet. Use Echo Spot to see a live camera feed from the nursery or your front door. Turn on the fan or dim the lights from the couch—all without lifting a finger. Control multiple devices at scheduled times or with a single voice command, like locking the doors and turning off the lights when you go to bed. Echo Spot works with smart home devices such as cameras, lights, TVs, fans, thermostats, garages, sprinklers, and more. Make hands-free voice calls to any of your contacts, or video calls to friends and family who have an Echo Spot, Echo Show, or the Alexa App. When you're busy making dinner, just ask Alexa to place a call from your Echo Spot to anyone. You can also enable the Drop In feature for when you want to connect instantly with other Echo devices in your home or closest family and friends. For example, you can drop in to ask what time dinner will be ready, see the baby's nursery, or check in with a close relative. With the Alexa App, conversations and contacts go where you go. When you're away from home, use the app to make a quick call or send a message to your family's Echo. Alexa calling and messaging is free—to get started, download the latest version of the Alexa App on a smart phone with iOS 9.0 or higher, or Android 5.0 or higher, and verify your mobile number. Echo Spot can use tens of thousands of skills and counting. Skills add even more capabilities like ordering a pizza from Domino's, requesting a ride from Uber, tracking your fitness with Fitbit, controlling your TV with Dish, and more. To enable new skills, just ask Alexa. Alexa is always getting smarter—the more you use Echo Spot, the more Alexa adapts to your speech patterns, vocabulary, and personal preferences. And because Spot is always connected, updates are delivered automatically. Just in the last few months we've added Alexa calling and messaging, multi-room music, and reminders, along with skills from third-party developers.